The professionals at ClearVista Financial offer personal financial planning services with the goal of helping our clients live well today and tomorrow. We believe that personal financial planning is a process, not a product. Our financial planning process begins with a comprehensive understanding of your current life situation and your life goals. 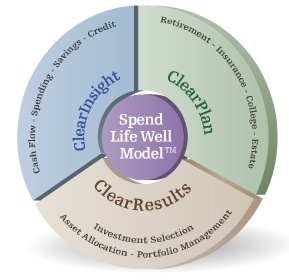 We then build a baseline scenario of your financial life using our innovative Spend Life Well Model™. The Spend Life Well Model is a dynamic economics-based approach to evaluating the many possible scenarios in your real financial life. This approach helps you understand the impact of your life decisions on your ability to live well in the future, not just on the size of your nest egg. Financial planning then becomes a process of making informed choices to help improve the balance between living well today and tomorrow. Rather than updating the model after major changes in your life, you can actually use our tools to help decide on major life changes.